I LOVE my U.S. version 2017 Toyota 86. Except the Gauge Cluster Face (white tachomenter). Therefore, I wish to swap out my Toyota FR-S/86 Gauge Cluster Face for one that has a black tachometer (like the BRZ). I can order a custom face (overlay) to do this, but I will need to update the current 2013-2015 available overlays to match any additions/deletions (changes in position) in warning lights that have been made between the 2013-2015 U.S. FR-S and the 2017 U.S. Toyota 86. To this end, could some generous expert out there please enlighten ignorant me as to the differences in the 2013-2015 FR-S and the 2017 Toyota 86 Gauge Cluster warning lights including number, type and position of warning lights on the 2017 Toyota 86 Gauge Cluster? Take a look in the 13 manual (link attached) and compare to the locations of your lights. I think that two warning lights have been added above the tachometer (one on the left and one on the right)? The one on the left is "Hill Start Assist Control ON Indicator" and the one on the right is "unknown" (that is, I don't know what it is and cannot find reference to it). I would really appreciate it if someone with access to/first hand knowledge of, both the 2017 T86 and 2013 FR-S could confirm that these are (1) the only changes (additions/deletions) that have been made, and (2), what the "unknown" is (note that I have referenced the 2017 T86 Owners Manual and cannot find this "unknown" type on the right) warning light in it. 2017 Toyota 86 Gauge/Instrument Cluster Warning Lights. Note the 860 model has a different gauge cluster. Supratwins/TRD-X aka Jim Gone to a higher plane of existence! Thank you very much. Extremely useful. The manual also provides the text "...the following illustration displays all indicators and warning lights illuminated..." on the same page as this illustration (p. 161). 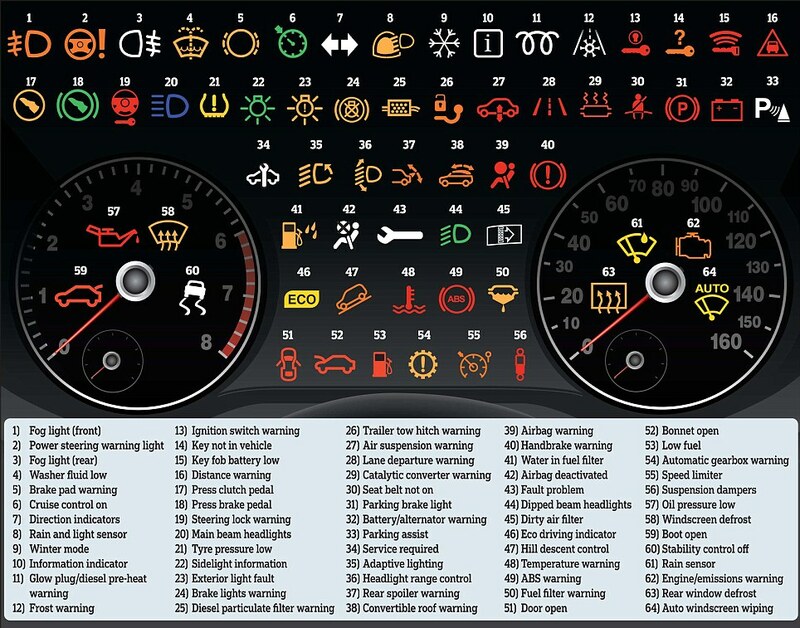 I thought that this would provide all the information needed to order my custom instrument cluster overlay. 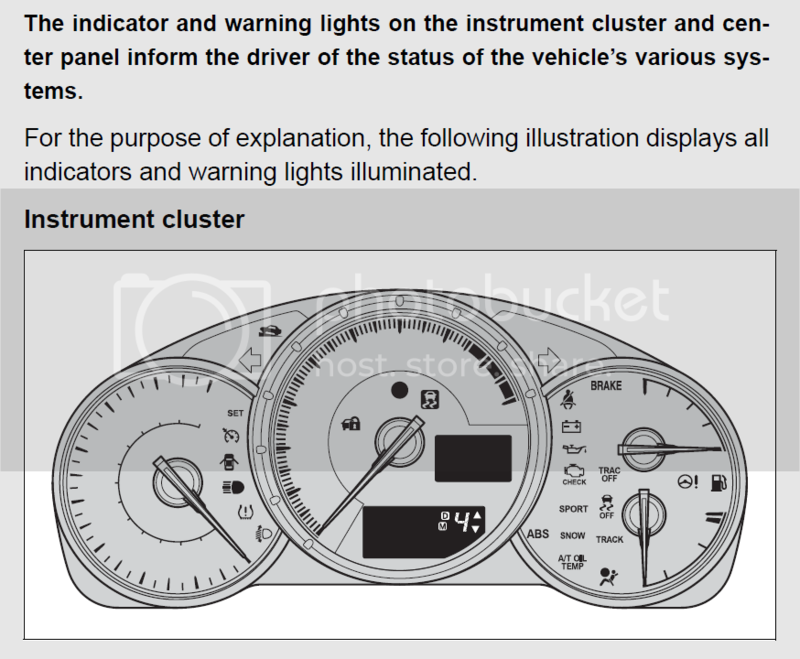 Unfortunately, the same manual provides a slightly different instrument cluster face illustration (CTHPIAW174) on page 426. The illustration on page 426 of this same manual has one additional indicator light above the right hand signal indicator. This "additional" indicator light looks like an "exclamation point inside a lighted light bulb". There is no other reference to the meaning of this "exclamation point inside a lighted light bulb" in the manual which further deepens the mystery. Here is an enlarged photo of a 2017 Toyota 86 cluster face showing the same "additional" indicator light that looks like an "exclamation point inside a lighted light bulb" as indicated on page 426 of the manual. Could this additional indicator light be the result of options such as fog lights? I have not taken possession of my ordered car yet, and will not do so for several months. I would really appreciate it if someone could help me clear up this mystery by telling me if this additional indicator light "exclamation point inside a lighted light bulb" actually exists on the 2017 Toyota 86 instrument cluster face (as on page 426 of the manual) or if this is an error in the manual itself. I need to confirm this before ordering a custom instrument cluster overlay and I have not taken possession of my car yet so that I cannot do the same myself at this time. Any help to solve this little mystery will be very much appreciated. Thank you for your helpful hints and suggestions. I only have one question left: what does the indicator in the red box (above) actually indicate? It does NOT appear to feature in the 2017 Toyota 86 Owners Manual(?). From other sources (http://i.dailymail.co.uk/i/pix/2013/...79_964x757.jpg) it appears to be an "exterior light fault" indicator(?). Can someone who has already received shipment of their 2017 Toyota 86 confirm this indicator...and what it is? I don't have a 2017, but I can confirm that the indicator is for an 'exterior light fault' as my wife's Mini has the same warning light for that reason.